Kitamaat Village Council and additional recreational service providers in the Kitlope. Provides on-site Haisla First Nation co-management of the Kitlope through their Kitlope Watchmen program, from approximately May to October. They also provide commercial recreational tours and wildlife viewing in the Kitlope and other parks and protected areas along Douglas Channel and Gardner Canal. This park encompasses the world’s largest intact coastal temperate rainforest. This unique rainforest has old-growth trees over 800 years old. The Kitlope valley is an important habitat for marbled murrelets, bald eagles, moose, grizzly, black bear, wolf and waterfowl. 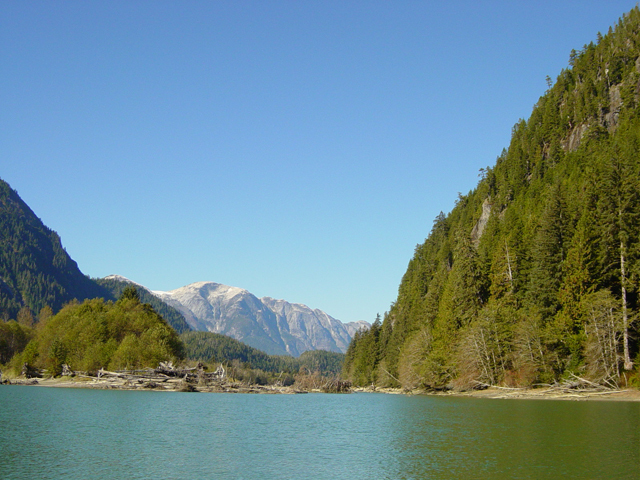 The Kitlope valley lies within the traditional territory of the Haisla First Nation, based out of Kitamaat Village. It takes a few hours to travel to the Kitlope by boat from Kitimat. The best time to visit the area is in July and August, when the marine conditions and the weather are at their best. Along the way visitors can do some fishing; visit Weewanie or Shearwater Hot Springs; watch for whales, seals, eagles, mountain goats, and bears; and view the wonderful waterfalls, tall granite cliffs, and hanging glaciers along Gardner Canal. Visitors arriving in larger vessels can anchor just outside the estuary area (deeper water) and then take a smaller boat (jet boats are best) up the Kitlope River to Kitlope Lake. There are no roads in this wilderness area. Information for interpretive programs may be available from the Kitlope Watchmen at the BC Parks cabin from May to October. There are no developed trails in this Conservancy. Backcountry areas are not suitable for dogs or other pets due to wildlife issues and the potential for problem with bears. Please Note: Any maps listed are for information only  they may not represent legal boundaries and should not be used for navigation. The park is located at the end of the Gardner Canal, on British Columbia’s central coast, approximately 50 km northwest of Bella Coola and 120 km southeast of Kitimat. The area is accessed by boat to the end of the Gardener Canal. The area is accessed by boat and aircraft only. Visitors should be experienced in ocean navigation and wilderness survival. Visitors can use jet boats to access Kitlope Lake and Kitlope River systems. Reference: Marine Charts #3743 (Douglas Channel) and #3745 (Gardner Canal). Reference: 1:50,000 topographic map #93 E/4 (Kitlope Lake). Any maps listed are for information only  they may not represent legal boundaries and should not be used for navigation. History: In 1994 the West Fraser Timber Company relinquished all rights to harvesting in the Kitlope area without consideration or compensation from the B.C. Government. The conservancy was proposed with cooperation between the Haisla Nation and the B.C. Government to protect the largest intact coastal temperate rainforest in the world. The Kitlope was first established as a Protected Area on February 20, 1996. Its designation was later changed from Protected Area to Conservancy on June 27, 2008. The Kitlope area encompasses a rich diversity of natural and cultural heritage values. Cultural Heritage: The Kitlope Valley lies within the traditional territory of the Haisla Nation. Known to the Haisla as “Hushuwashsdu” or “Source of the milky blue water,” the Kitlope area is a focus of native lore and native stories such as “The Man Who Turned to Stone.” The Kitlope Valley also has significant archaeological site potential. The Haisla have used the Kitlope area for the harvesting of plants, animals and fish including salmon and oolichan. Conservation: The area encompasses the world’s largest intact coastal temperate rainforest. This unique rainforest has old-growth trees over 800 years old. The Kitlope watershed provides a large intact diversity of wildlife and fish habitats, ranging from estuaries, lakes, rich flood plains, steep side slopes and alpine areas. The management plan for the Huchsduwachsdu Nuyem Jees / Kitlope Heritage Conservancy was approved on October 6, 2011 and signed off by the Haisla Nation on May 23, 2012. There are paddling, canoeing and kayaking opportunities at this park. Good paddling on Kitlope Lake and Tezwa River. Click on the names for more details. There are fishing opportunities for trout/char and salmon. Anyone fishing or angling in British Columbia must have an appropriate licence. Kimsquit Bay Lodge provides guided fishing trips. There are no developed trails at this park. Use caution when exploring the backcountry/wilderness area. This Conservancy is open to hunting during lawful hunting seasons but is closed to Grizzly Bear hunting. Please check the BC Hunting and Trapping Regulations for more information. A hunting guide is available within the park. Wild Coast Outfitters provides guided hunting trips. Good swimming sites can be found along Kitlope Lake. There is a very nice beach area at the Rediscovery Campsite on Kitlope Lake. There is no viewing platform but there is wildlife viewing along the Kitlope estuary, lakes and rivers. While campfires are allowed and campfire rings are provided at each campsite, we encourage visitors to conserve wood and protect the environment by minimizing the use of fire and using campstoves instead. Limited burning hours or campfire bans may be implemented. Some back country pit toilets are available for public use at the Miskusa Indian Reserve (IR #16), BC Parks Cabin, and the two campsites at Kitlope Lake. Wilderness, backcountry or walk-in camping is allowed, but no facilities are provided. All sites are on a first-come, first-serve basis. Note: There is a BC Parks/Watchmen Cabin on the south side of the Kitlope River (Lat. 53º 12.95’ N; Long. 127º 51.78’ W)  it is not available for public use or camping.